Raised in Houston, Texas, drummer Reggie Quinerly attended Houston’s High School of the Performing and Visual Art. He’s just one of the many successful musicians who graduated from this school, including renowned jazz artists like Eric Harland, Chris Dave, and Robert Glasper. Quinerly continues to grow and evolve as an artist, as demonstrated by his 2012 debut album, Music Inspired by Freedmantown, and his second release, Invictus, in 2015. On both albums, Quinerly featured vocalists on at least one or two tracks, which is somewhat common for jazz instrumentalists. 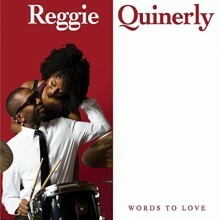 For his third album, Words To Love, Quinerly composed music and lyrics for each track, creating an album entirely of songs. Enlisting up and coming male and female jazz vocalists to help him get his message across, Quinerly showcases the talents of Chicago-born Milton Suggs and Brooklyn’s own Melanie Charles. The two vocalists trade off song for song, telling a story of the many facets of love. They are backed by a renowned rhythm section including Orrin Evans on piano, Ben Wolfe on bass, and of course, Quinerly on drums. Also, four tracks on the album feature the well-known alto saxophone player, Jaleel Shaw. It’s clear when you listen to Quinerly that he’s a straight ahead jazzer. The album includes a very nice mixture of modern jazz song forms and melodies with an obvious nod to older styles like hard bop, which can be found in Quinerly’s harmonic choices as well as the rhythmic feels he chooses to employ. Also, Quinerly’s education and influence from great jazz drummers, like Max Roach and Tony Williams, can be clearly heard. This is especially apparent in certain songs on the album like “Love’s Ferris Wheel,” sung by Charles, which is meant to be a nod to songwriters like Cole Porter or Rogers & Hart, even including a rubato verse prior to the 32-bar chorus. Quinerly lays down a great drum solo on this tune, but for an album lead by a drummer it would’ve been nice to include more opportunities for him to show off. Also, at times Words to Love can feel a little stagnant, since almost every tune is either slow to mid-tempo. A couple of faster tunes or just another high energy drum solo could’ve helped to give the album some shape. Quinerly was inspired to create Words to Love because of his increased interest in jazz singers, specifically Lou Rawls. After hearing Rawls’ 1966 recording of “A Shadow of Your Smile,” he became enamored with jazz vocals, adding singers like Ella Fitzgerald and Betty Carter to his playlist. Quinerly also wanted to explore love and all of its varieties and chose to open the album with his tune “Until I Met You,” pertaining to the search for love and falling in love. Shortly after is “Still Frames,” which speaks about the love of memories and times past. Then, of course, there is the gorgeous title track, “Words to Love,” which is easily the most moving song on the album. Charles’ light yet present vocals float over the combo, leading into a wonderful alto saxophone solo by Jaleel Shaw, before they come together, intertwine and share the space of the song as they enter into the final verse. Words to Love has a very classic hard bop feel created by Quinerly’s straight ahead approach to composition. Though perhaps not as adventurous as his previous albums, Words To Love is an amazing album that keeps the traditions of jazz alive.